The fireworks display is the finale to Inverurie's Christmas Weekender. Inverurie is gearing up for its Christmas Weekender. The extravaganza of festive fun and entertainment will take place this Saturday and Sunday. It is organised by Inverurie Events and last year around 3500 people packed the town centre. Secretary Neil Baillie said: “This is a big event in Inverurie’s calendar and more and more people are turning up to it. Proceeds from the spectacular go towards helping fund the town’s Christmas lights. One of the highlights will be the St Andrew’s Day Parade on Sunday starting at 3pm in Victoria Street and making its way via West High Street to the Square. Market Place will alive with music, carol singing and local organisations will be manning stalls with Christmas gift ideas. 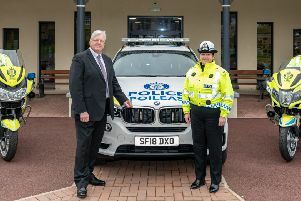 Organisers, along with Police Scotland and Aberdeenshire Council, have drawn up a traffic management system, including waiting restrictions, for the Sunday. The event brings the local community and visitors together to herald the start of festivities. Many shops will be open all week until Christmas Eve.